If a new employee has just been hired, or an already-existing employee has personal information that needs to be updated, then an employee personal information form can be used to keep a record of that information. The employee personal information form is particularly useful in case a manager or department supervisor needs to contact the employee about any upcoming changes or events at work, or needs to contact any third parties related to the employee, should the need arise to do so. 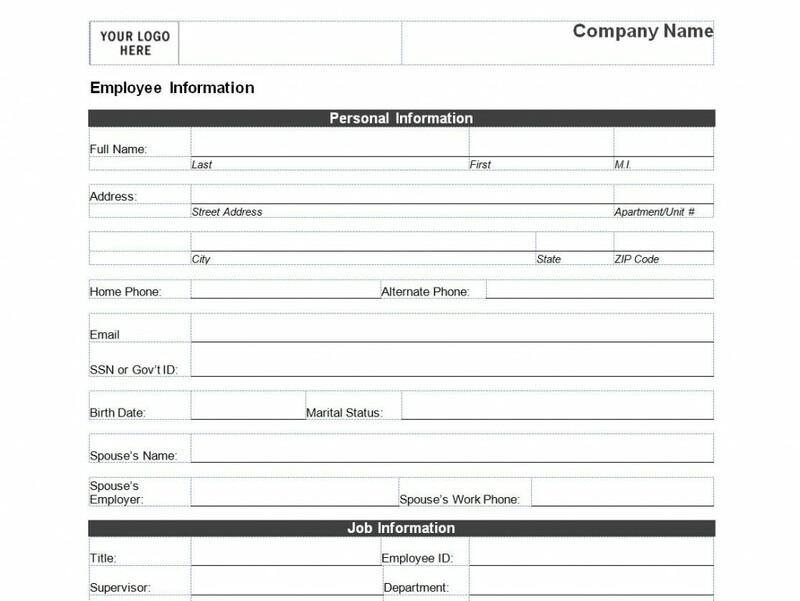 One good thing about this template is that it is already formatted with most of the fields that are found in an employee personal record document, so downloading it will save time from having to create a personal information form from scratch. In the field where it says “your logo here” you can right click inside that box and add your own company logo from a file to make the form more official looking. If a logo is not necessary you can simply delete that box and change where it says “Company Name” to your company name and use whatever font you want to do so. The job information field may need to be tweaked a little bit in some areas. Since some information may need to be filled out by certain authorized personnel only such as salary, start date, and employee ID, you may want to erase those out of the work information table and place them in a “to be completed by employer” table. You may also need to erase some fields if they are not necessary such as “work phone”, “alternative phone”, or “cell phone”. You can get this template for free right here on this page. At the end of the document you should include a little footnote that tells the employee that in the event that any of this information changes, they should contact the human resources department immediately so they can make changes to the form. You may also want to put a note at the top of the document stating that this information will be kept confidential and that only parties who have a need-to-know will have access to this information, so that the employee knows his privacy is safe.